The National Association of Realtors really has their work cut out for them in trying to convince the public that now really is a good time to buy or sell a house. Notwithstanding the flawed logic that there could be a simultaneous advantage for both parties in the same transaction, there are larger problems with making their case - a case that the mainstream media and much of the public aren't buying. Recall this full-page ad that has now appeared on two consecutive Sundays in major newspapers and notice the area circled in red. Shown above is the original version of the ad from last Sunday's paper indicating a 4.3 percent increase in pending home sales for the month of August. The NAR released new data for pending home sales in September indicating a decline of 1.1 percent (July sales were down a whopping 7 percent), so the ad required an update. Contracts for home sales in August are up 4.3 percent and the outlook is for home prices to increase next year. Housing prices are forecast to post gains in 2007, surpassing median home sales values in 2006. When you can't find data to support the story that you want people to believe, just omit the data and be more assertive - that almost always works. 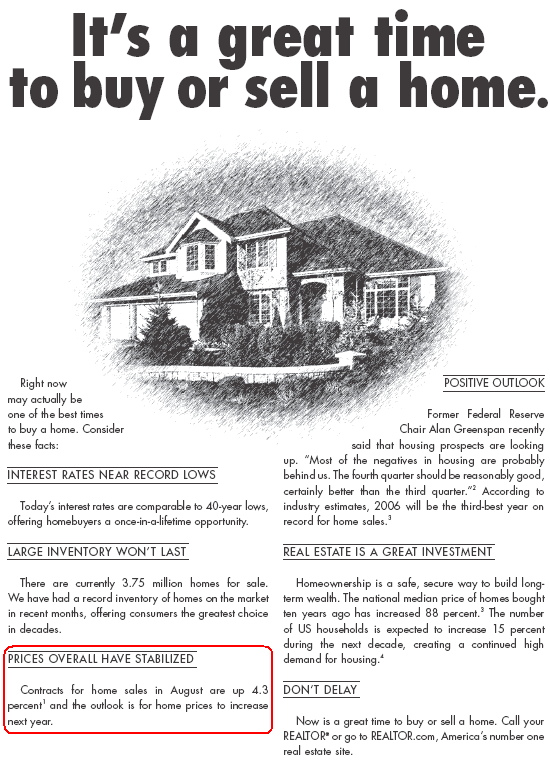 Realtor: We can't use the pending home sales data because that turned negative in September and we've already promised the New York Times that we would update the ad. Adman: So what do we do? Realtor: Just say that prices are going to go up. Adman: Shouldn't we cite some source of data to back up that claim? Realtor: No. And while you're at it, that heading that says prices have stabilized? Change that to say that housing prices are going up next year. Adman: Shouldn't you say that housing prices are forecast to go up or that the outlook is for higher prices? Realtor: No, just say that prices are going up. The mainstream media seems to be catching on. There have been fewer and fewer interviews with realtors in the increasing number of stories about the current housing slowdown. This segment on last Friday's ABC Nightline makes it clear that things have changed dramatically for home sellers. Martin Bashir: We begin tonight in the world or real estate where anyone heading out to an open house this weekend is probably expecting to find a bargain. That's because the real estate market is sinking by the month. The median price of a new home sold in September dropped by almost ten percent a year - that's the largest decline in 36 years. And perhaps the clearest sign that the market isn't what it used to be are the lengths that some people are going to just to get the properties off their hands. ABC's Heather Nauert reports from Los Angeles with a new installment of our series: Realty Check: Surviving the Slowdown. Heather Nauert: Look no further than all those For Sale signs for a literal sign that more and more homes are hitting the market. Nationwide, there are a jaw-dropping one million more houses for sale today than there were last year. Luring a buyer isn't easy anymore which means if you want a good price for your house, you're going to have to work for it. Homeowners and homebuilders are pulling out all the stops offering give-backs and give-always, doing whatever it takes to sell that house. The first sales gimmick - let them eat cupcakes. Meet Cindy Schwanke who's been trying to sell her suburban Los Angeles home for nearly nine months. Cindy Schwanke: We never really thought we'd have a problem selling. The neighbors have never had a problem selling, our relatives have never had a problem selling their homes, so we didn't anticipate this at all. Nauert: To make matters worse, Cindy and her family have already bought a new house. They're now paying two mortgages. So last summer she quit her job as a pastry chief to devote all her time to marketing her old house where she is armed with desserts, ready to snare a prospective buyer. Schwanke: I try to bring people in. I bake cupcakes for them. I offer them water. I do whatever I can to make it a pleasant experience for them. Nauert: But in many cases, cupcakes alone won't cut it. Here on the West Coast, home sales have plummeted over the last two years. Even worse, many buyers who bought homes are now backing out of their contracts. The piece goes on to detail three other "gimmicks" - slashing prices, giving gifts, and creative marketing. Now slashing prices isn't a "gimmick" at all. Slashing prices is what happens in a market economy when prices have been bid too high. Gifts and creative marketing certainly fall into the "gimmick" category, though the families of actors that homebuilder Centex employs to make model houses look lived would be more properly classified as a "creepy gimmick". It's not clear how prospective homebuyers are responding to this - the homebuilder representative says it's working just wonderfully - but it would seem as likely to scare people away as to make them feel more "at home". It was just creepy watching a family of five paid actors singing Happy Birthday on cue as prospective buyers walked through the front door. To end the segment, the dour Mr. Bashir informed the viewing audience that Ms. Schwanke had indeed sold her home - for $100,00 less than she first listed it. Based on the prognostications offered up on Saturday during the Fox News business infotainment program Cashin' In, Ms. Schwanke may look back on her home sale in 2006 wondering why she was complaining to Nightline. Terry Keenan: The boom hasn't gone bust but there's no denying a slowdown in the once sizzling housing market. But could homes be worth less in November of 2008 than right now? Wayne, that's two years away, what do you think? Wayne Rogers: Well, as I said, there are three phases - the absorption rate slows down, then you have a price correction phase, and finally a foreclosure phase before this all turns around. Right now, we're just in the beginning of the price correction phase, and we see it in the homebuilders like D.R. Horton and Toll Brothers which have slowed down enormously and they get higher cancellation rates. So, it's not going to be until the end of 2008 before we see a real turn around. Dagan McDowell: These prices won't even bottom in some of these once really hot areas until 2008, 2009 even. It could go on even longer than that - places in California, in Las Vegas, and you can be sure that this hangover is going to play into the election two years from now. Keenan: There's a lot of pain out there Adam, but it hasn't trickled into consumer spending which is still strong despite all the naysayers. Adam Lashinsky: That's right Terry, because largely the price correction that Wayne talked about at the outset is a correction in the housing stocks. There hasn't been as big a correction in housing prices themselves, and I think that's yet to come. That's why you haven't seen it in the economy. I think people who think we've bottomed already - that's just wishful thinking. Everything everyone's been saying so far is exactly why this probably will go on longer than the wishful thinking people say it will. Keenan: Well, it was a very long boom. Does that mean it will be a very long bust Gary? Gary Kaltbaum: Terry, in my study of these cycles, it's not months, it's years. I think we are in the early innings and anybody who calls the bottom right now - it is wishful thinking. I heard Alan Greenspan came out and called the bottom - that means that it's definitely not the bottom, and I tell you, 2008 is being a little too positive. The last time we had a big downturn, we were talking about a decade, which would be normal after the big move up. Jonas Max Ferris: First of all, you can't have crashes in real estate. They had one in Japan in the 80s, they had one here in America in the 1920s. This time we might get a slow train wreck because interest rates are remaining low, but I definitely think that in '08 we'll have lower prices. In urban areas down 40 percent. Nationally, probably just 10 to 20 percent by '08. It's going to weigh on the election. This being Fox News, one could speculate on the motivation for asking about home prices at the time of the next election in 2008 (Democrats have been warned here about trying to "fix" the housing bubble - they're more likely to get blamed for it if they attempt such a thing), but nonetheless, this was a very negative crowd. It's funny how you never heard anyone talking about the duration of the housing downturn until housing actually turned down. Was the National Association of Realtors watching? If they were, they must now realize how much more work they have to do if the public is to believe that housing prices are headed back up next year. Promising price appreciation like they have in the revised ad is a direct violation of their own Realtor® Code of Ethics. How about the statement "Large Inventory Won't Last". Would you mind supplying us with one stick of evidence to support that? With a rolling backlog of homes for sale already, and an expected surge in spring as sellers flee for the exits, the inventory sure looks like it will be larger than ever next year. Why does anyone even listen anymore. The drivvle the spout is so discreditted, saying it here is just preaching to the choir. Rant over. As the inventory piles up in the spring as Carlsbad Jim said the finger opointing will begin. Robert you are right, I just hope the internet has supplanted these clowns when the next upswing comes. FWIW Robert, my brother-in-law golfs with Lareah and says he is a nice guy. "First of all, you can't have crashes in real estate. They had one in Japan in the 80s, they had one here in America in the 1920s." I love this. Economics theory niggle here: actually, that there is simultaneous advantage for both parties in the same transaction underlies most economic transactions. Yes, this is simply theory, but a bit of reflection shows it jibes well with reality: anytime you have disposable money, your advantage is in exchange it for some good or service you can actually use. To do this, you simply find someone with more goods than they can personally use, or an extra ability to dispense of some service. Then the exchange can happen and both parties benefit. Now, things start to look less sanguine when the transaction is not happening of its own accord, and serious arm-twisting is required on the part of one side to effect it. Then one should question whether the mutual advantage is so real. Aaron, thanks for making that point, rather more articulately than I was about to. I'm not an economist, but maybe the distinction also has something to do with the nature of the goods being exchanged. Many things, especially nowadays, are easy to exchange for mutual benefit. For example pharmaceuticals or software. And we don't usually have to take out a big mortgage to do so. Real-estate seems to be part of a fixed size of cake transaction. If I sell a house and it doubles in value next year, I've lost out, and the buyer has benefited, and vice versa. The only time when it would be mutually beneficial I guess would be if prices rose by a steady foreseeable amount every year, and buying or selling would enable me to use equity most efficiently. By the way, imagine if a Fund manager or analyst ever said: XYZ? Oh, yeah, its a great time to BUY OR SELL that. (They would cart them away). Gee, you almost think these guys are transactional based or something, taking a cut of any buy or sell. This is probably what Tim had in mind. "Expanding inventories will depress prices in both new and existing homes but NAR is still predicting the median price of an existing, single-family home will increase 1.9 percent this year to $223,700 and 1.7 percent next year to $227,500. New home prices should drop 1.1 percent this year to $238,400, before gaining ground next year, up 1.3 percent to $241,400." Does anyone have any prior forecasts -- like from six or eight months ago? Don't miss the Carol Lloyd's San Francisco Chronicle column on this ad, Don't Delay! Buy Or Sell Now! Right?, including this hilarious spoof. Sorry, but I must be firmly opposed to our argument in light of current economic theory. Basic economic theory does not support the concept of a "winner" and "loser", that much of your statement is true. However, and this is a big however, economic theory has come a long way in describing participcant expectations. If a seller expects a lower future price (based on theories surrounding speculation of investment assets), and a buyer expects a higher future price (once again, because frankly, a house is only a use asset when there is some connection of rents (cash flows) to price). That said, game theory in economics delineates a clear winner and loser based on actual outcomes measured against expections. In theory, there can both be winners in the minds of the participants, but there is only one winner in a zero-sum game. An investment asset purchase is exactly that... each dollar more spent by the buyer is a dollar more the seller receives (one nit to pick could be transaction costs, but these are paid by seller and negotiable or negateable with FSBO). The only remaining components are a risk-free rate of return and time. However, after time has elapsed, one can look backwards and determine a winner based on expections. This is why game theory of economics is much better at determining a "winner" and "loser". Otherwise, economics theory only assigns "winners" for each and every transaction, even under cooercion. The transaction itself determines that both participants are winners. This is too rosy of a concept for my dismal science. Question - why is all the focus on the housing bust related to Realtors, NAR and Lereah. Shouldn't we be placing the blame on the overpriced housing market on the consumer (you and me) for paying too much, say $500,000 for a $250,000 home. Noone forced us to do this and now the blame goes back to groups and organizations such as NAR - not on our own dumbass selves. Is that fair? What did we think would happen after we paid too much? That someone dumber than us would come in and pay even more for an already overpriced property? Housing is still a great investment just like the stock market. Losses in housing only occur on paper (as is the case with stocks) unless you decide to sell when they become reality. Just because housing is declining now doesn't mean you have to sell and take a lower price. Time (the only factor that matters) shows that housing WILL appreciate if you wait. And buying now (or in the near future) if prices continue to decline is not a bad situation to be in. Real estate is still a very nice long-term investment (read: long-term).